When you get on the MARTA Rail System and... **START TO MOVE* on the Rail from the Airport, Greyhound bus station, or AMTRAK MARTA Rail Stations, please call me at . This gives me a TIMED heads up and know you are here and MOVING! When you arrive at the North Springs MARTA Station(N11), you will go down the steps and out the gates on the parking lot deck side. I will meet you in front of the gates next to the Cashier. There are quite a few questions from incoming hikers about being picked up at Atlanta Hartsfield-Jackson Airport. I thought I'd pass some information along to save you time, money, and a lot of headaches. 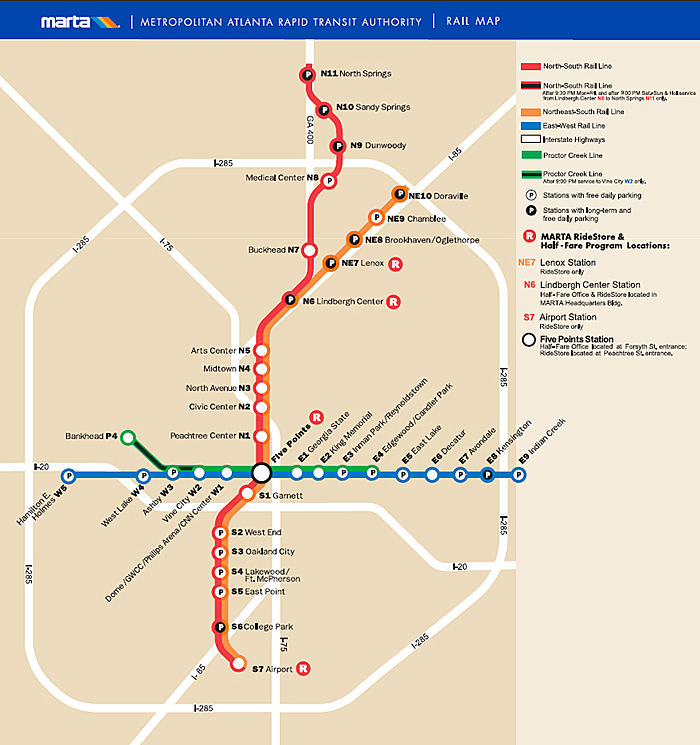 The MARTA Rail System goes directly to the terminal at the airport. Most folks that provide transportation prefer to pick up hikers at the North Springs MARTA Station(N11). It's the furthest station North on the line. The cost is $3.50 each way for the 40-45 minute ride and you get to see some really cool sights of the city. Here are a few tips to help you easily get to the North Springs station. First of all, when you are ready to leave the airport, you want to get on the North Springs train. There are 2. Do NOT get on the Doraville train, It'll be a looong ride to get back as you'll see in the map. The trains usually run every 20 minutes during off peak hours and every 10 minutes at the busiest times. you will have to use the Doraville Train from the airport then change to the North Springs Train at the Lindbergh MARTA Station (N6) to get to the North Springs Station--Please ask for assistance if you need!!! As far as your gear and supplies, the NTSB prohibits the carry on of fuel of any kind. Check with your carrier for the rules. It'll help you get along faster at security check points. For those coming in to Atlanta Greyhound Terminal, MARTA is within walking distance (across the street) of the rail station Garnett Station(S1). Just ask the folks there and they will gladly direct you. Follow the rail instructions above. If you are coming in to the Atlanta AMTRAK Station, you will get on the #110 MARTA bus to the Arts Center Station(N5) and follow the instructions above to N. Springs. You can also walk 1 mile to the station. Just ask the AMTRAK Staff for directions. If you do decide take the bus, you will pay an additional $3.50 for the MARTA Rail. They do not offer transfers. Please print this page if you need to. You can always call me if you have questions! Just an FYI, there is an REI minutes from the station. There's also a Wal-Mart and lots of food as well. *Please let me know when you book your shuttle if you need to go to REI, as I take a different exit to the rail station to pick you up, thanks!